While most of the films that are being showered with awards by the various film critics and guild organizations in the end-of-the-year awards season are a mix of Hollywood and American independent films, a few European films (most notably from France) are seizing some of the awards thunder. When the National Society of Film Critics made their awards announcements earlier this week, a few French films and talents were prominent. Although THE HURT LOCKER was the overwhelming winner of the Best Picture prize, the surprise second place went to SUMMER HOURS, the family drama by Olivier Assayas that was one of the critical favorites of the year. Assayas also came in second to Kathryn Bigelow (THE HURT LOCKER) in the Best Director race, over such formidable competition as Jason Reitman (UP IN THE AIR), James Cameron (AVATAR) and Quentin Tarantino (INGLORIOUS BASTERDS). He also came in second in the Best Screenplay contest, which included winners Joel and Ethan Coen (A SIMPLE MAN) and Quentin Tarantino (INGLORIOUS BASTERDS). 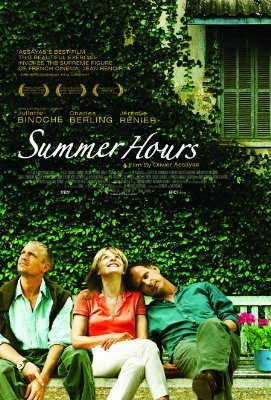 SUMMER HOURS was the favorite in the Best Foreign Language category, winning top honors over such well received films as EVERLASTING MOMENT by Swedish auteur Jan Troell, POLICE ADJECTIVE, the latest film from Romanian enfant terrible Corneliu Porumboiu, and 35 SHOTS OF RUM by French icon Claire Denis. THE BEACHES OF AGNES, a lovely memory documentary by Nouvelle Vague pioneer Agnes Varda, was named as Best Documentary, over the films TYSON and ANVIL! THE STORY OF ANVIL (both of which did not make the Oscar Documentary cut). German cinematographer Christian Berger took top place in the Best Cinematography race for his haunting filming of the black-and-white historic drama THE WHITE RIBBON by director Michael Haneke. The biggest surprise was the naming of French actress Yolande Moreau, who narrowly won for her work in the biopic SERAPHINE. She won the prize over second place (and Oscar favorite) Meryl Streep for her tour-de-force incarnation of foodie Julia Child in the comedy JULIE AND JULIA. As expected, Christoph Waltz won Best Supporting Actor honors for his ferocious portrayal of a sadistic Nazi in INGLORIOUS BASTERDS.